Canter Brown, Jr. In the Midst of All That Makes Life Worth Living: Polk County, Florida, to 1940. Tallahassee: Sentry Press, 2001. 325 pp. No price listed (cloth), ISBN 978-1-889574-12-7. Canter Brown, Jr. argues that the history of Polk County, Florida, can be viewed as a series of economic booms followed by inevitable--but never anticipated--collapses. Historical opinions about the county demonstrate this dichotomy. An African American newspaper writer noted in the early 1890s, "Every poor man ought to rush to Polk County. Here Providence has spread a beautiful table" (p. 168). Conversely, a local politician noted in 1936, "This county is the worse 'Hell Hole' in America today" (p. 317). Brown emphasizes this boom or bust theme in a thoroughly researched, well organized, readable, and long overdue work. In the Midst of All That Makes Life Worth Living is reportedly the first comprehensive history of the county since 1928. The author provides several compelling reasons to break the seventy-year silence on the matter. First and foremost, as Polk County prepares to "emerge as the state's center of growth and development," there are lessons to be gained from the bubble economies of the past (p. xi). Secondly, past histories generally neglected African Americans, women, and poor white "crackers," omissions that the author takes pains to correct. 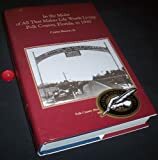 Written under the auspices of the Polk County Historical Association, Brown provides a chronological narrative that highlights the county's development. Chapter One is a brief survey of Florida history from 3,000 BC through the Second Seminole War in 1841. The subsequent chapters cover varying three-to-seven year periods from 1842 to 1940. The chapter headings neatly fit local development into a national chronological context, a practice that makes the work accessible to non-Floridians. The county's early economy was marked by frontier conditions, military operations against Native Americans, and ultimately, Indian removal. Like most southern frontiers, the earliest settlers were largely self-sufficient farmers who migrated from within the region. The first economic boom amongst these pioneers began under the Confederate flag. While the Civil War was not a galvanizing event for Polk Countians--the frontier region with scarcely 150 slaves spawned as many Unionists as Rebels--Confederate supporters formed "Cow Cavalry" units to raise and supply needed beef for the rebel army (p. 95). Many Polk county servicemen were allowed to return home to participate in this venture and some residents saw the glimmer of entrepreneurial possibilities. After the cattlemen weathered Reconstruction, the beef industry turned its vision south towards Cuba. The Cuban cattle business brought much needed gold to the region, but generally led to the accumulation of personal goods and hoarding of doubloons rather than investment and development (113). The vast majority of citizens remained landless and poor. Ultimately, tick-born disease threatened the vitality of this particular economy. The next booms--citrus cultivation and resort development--happened almost simultaneously. Citrus crops were introduced in the late 1870s and farmers hoped to prosper in Polk County's mild climate. These same conditions appealed to colonies of British migrants seeking tranquility and sunshine. Development in 1880s depended on good weather and railroads. The former was fairly constant during the early part of the decade, the latter were wooed by hotels and entire communities. Ultimately, railroad development made the difference between establishing a thriving community and fading away into pasture and many residents were disappointed with the results. The bust was completed in the late 1880s when cold weather and frost wreaked havoc with the citrus industry. In response to changing local, national, and international conditions, Polk County in the early 1890s enjoyed growth in phosphate fertilizer manufacturing and forest products, especially turpentine and rosin (179). The initial demand for these products greatly increased the population and caused property values to soar. Once again, the boom was short lived as the demand for the new products crashed during the panic of 1893. Simultaneously, the weather again turned colder, citrus groves frosted, and vast tracts of land returned to the county for taxes. The turn of the twentieth century marked the return of prosperity. The turpentine industry gave way to board lumber, otherwise, phosphates and citrus remained the engines of economic growth. By 1913, Polk County led state in citrus production resulting in local citrus exchanges (p. 215). Improved economic circumstances allowed communities to pave city streets and attract large numbers of new residents. The vitality generated by this boom was finally disrupted by World War I and the subsequent contraction of international markets. The demand for cattle, citrus, and phosphates was described as "dismal," this at a time when inflation was rampant (p. 241). Good times returned again during the 1920s as the entire state of Florida experienced its infamous land boom, a period of outrageous speculation. During this boom, Polk County communities competed with each other to attract developers and new residents. In the five years between 1920 and 1925, the population exploded from 38,861 to 63,925 and real estate values skyrocketed (p. 277). Despite these intoxicating times, collapse began in June 1926 as over-extended banks closed their doors. Oddly, Polk County remained amazingly solvent until 1933 as the citrus and phosphate industries remained strong. Ultimately, worldwide depression and a series of hurricanes wiped out both income sources and left Polk County destitute--at least through 1940, when Brown's narrative ends. This abrupt ending demonstrates the main weakness of this narrative, the lack of analysis. While the sources are good and the prose exceptional, Brown never returns to his theme of learning from past economic mistakes. A short concluding chapter or epilogue would add insight into the author's proposed comparison between history and present policy. The other difficulties with this manuscript are mainly stylistic. While Brown includes 110 figures, primarily photographs of places and individuals, his descriptive prose style would benefit from several additions. Physical geography, topography, and microclimates are important in the narrative. Maps, on the other hand are few--and to the outside reader, inadequate. A conveniently placed, comprehensive topographical map (perhaps on the inside cover) would be beneficial. Additionally, population growth is a major factor in the county's development. Brown includes the appropriate census statistics in his prose, but a chart of these statistics (again, for easy reference) would be useful. Finally, the author includes many lengthy offset quotations from primary sources in the body of his narrative. While interesting, they tend to break the flow of the prose. Placement in an appendix would seem more appropriate for most of these items. While the narrative has its difficulties, Brown is largely successful at his secondary goal, inclusion. This is especially true for African Americans, as their contributions to the county are interwoven seamlessly into the discussion. The author highlights many important developments, beginning during the Second Seminole War when Polk County witnessed the largest slave rebellion in United States history (16). Despite the scope of the revolt, there were few slaves in central Florida. Interestingly, they were truly African American--a mixture of African, Native American, and Caucasian people--Brown notes the frequency of liaisons between female slaves and male owners (p. 57). Despite the small population (perhaps five percent of the total), the first African American church was founded during the antebellum period and gained strength during Reconstruction. Before the Federal troops withdrew, all or mostly African American communities had already been established (p. 100). Population increase began in earnest during the 1880s when the railroad and turpentine industries became magnets for black workers. Segregation became extreme as the African American population exceeded thirty percent of the total. The increase occurred simultaneously with the regional emergence of Jim Crow laws (p. 200). Completing an all-too-familiar pattern, racial violence and lynching became common, although Brown contends that race relations generally friendly and that the "large majority of whites never joined a mob" (p. 226). In any event, the burgeoning African American population attracted noted dignitaries including Booker T. Washington and Zora Neale Hurston. The author's inclusion of women and "crackers" is adequate, but nowhere near as complete as his treatment African Americans. Discussions on the relationship between pioneer settlers and citizens from subsequent migrations would be enlightening. It is unclear where the true power structure of the county lies, with the new residents or the old. In conclusion, Brown has penned an exceptional local history that has a great deal to offer Polk County citizens. His inclusion of names and images of long-time natives will be of interest to resident antiquarians and genealogists. Additionally, the author's adherence to a chronological time line including important national events make this work a good reference resource for late nineteenth and early twentieth century historians wishing to examine the effects of extraction industries and commercial agricultural on divergent populations. If there is additional discussion of this review, you may access it through the network, at: https://networks.h-net.org/h-florida. Citation: Kurt E. Kinbacher. Review of Brown, Canter, Jr., In the Midst of All That Makes Life Worth Living: Polk County, Florida, to 1940. H-Florida, H-Net Reviews. March, 2002.